Our motto: Serving You with Country Charm ~ Designing Your Floral Arrangements with a Personal Touch! 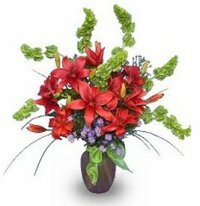 Darlene’s Flowers & Gifts is your premier full-service florist serving Flat Rock and South Detroit for over 41 years. We're members of FTD, Teleflora and the Michigan Florists Association and we only offer the freshest flowers and most fashionable designs to ensure that you will be pleased with your floral purchase. Our professional staff can assist you in choosing the most appropriate floral arrangement for any occasion... birthday, new baby, anniversary, speedy recovery, thank you, or just thinking of you! We deliver to all area hospitals and funeral homes in Brownstown, Flat Rock, New Boston, Huron Township, Carleton, Trenton, Rockwood, Grosse Ile, Southgate, Wyandotte, Taylor, Lincoln Park and Ellen Park. Our business hours are 9:00 am to 5:00 pm Monday through Saturday, closed on Sunday.